In the early 70’s a flagon of ‘Red Stripe’ was the wine I took along to a party. If it was dinner it was a bottle of Wynn’s Oven’s Valley Burgundy. We didn’t know ‘Red Stripe’ as d’Arenberg, or that d’Arry Osborn had created it. We just called it ’Red Stripe’. d’Arry celebrated his 90th birthday recently . In the final TWTW for 2016, Madge (Anthony Madigan : TWTW editor) wrote. 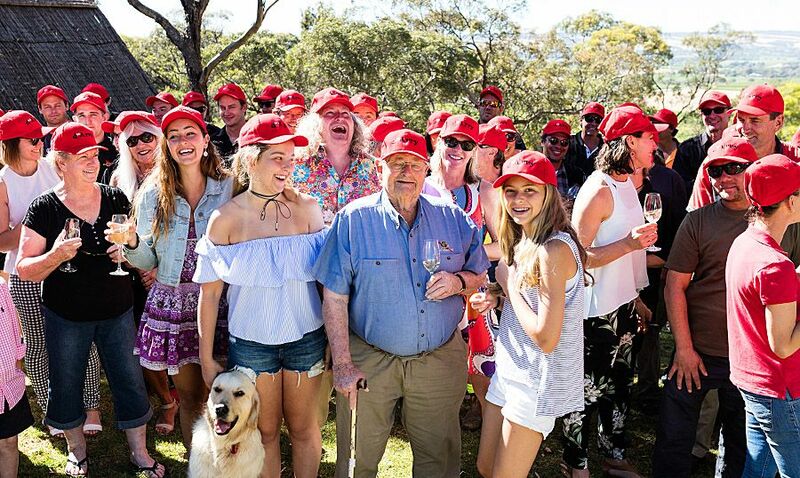 d’Arenberg had a party for d’Arry yesterday and everyone received a bright red cap. The guys also produced a great little booklet with messages from supporters of the great man far and wide. 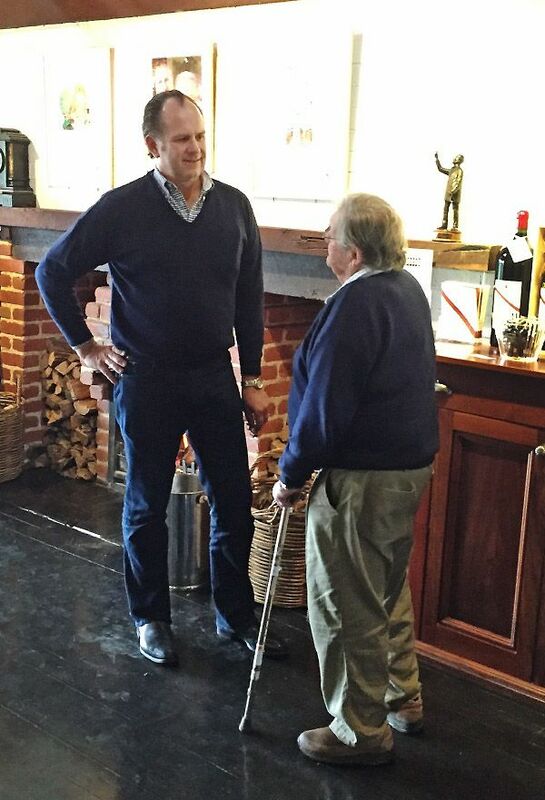 “d’Arry Osborn is loved and respected by everyone in and around the wine industry. 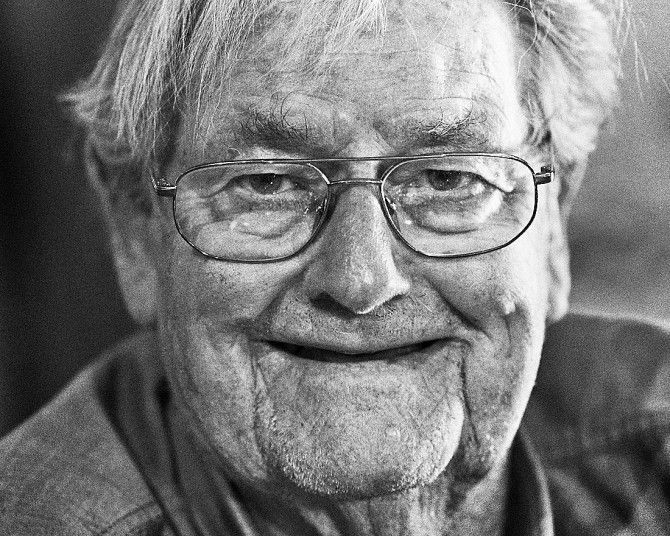 It is hard to imagine a more honest, gentle and open man or one who is more absolutely devoted to maintaining the integrity of the wine industry in general and McLaren Vale in particular.” Happy Birthday, d’Arry ! d’Arenberg’s party for d’arty, Every one got a red hat. Photo courtesy d’Arenberg. Edith Athelstone Clark d’Arry’s nurse. ‘Mickey’ was what he called her. 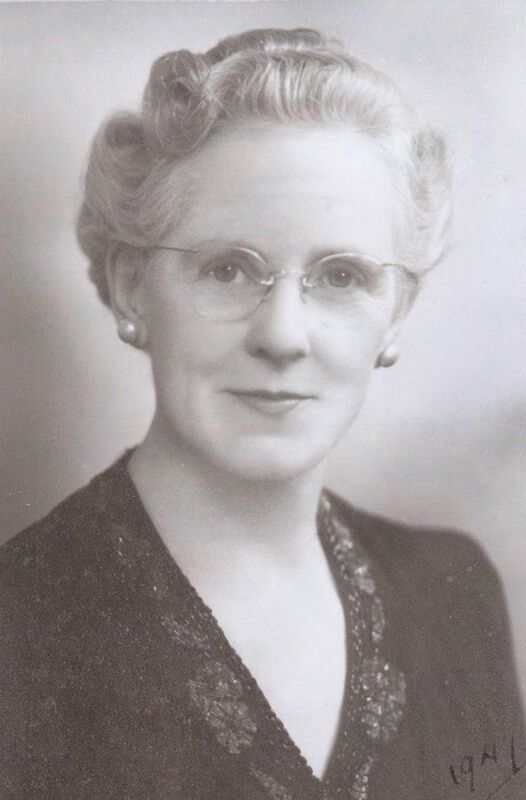 She never married – her father and mother separated and she came out here with her father who was a ship’s surgeon, he called himself Dr Clarke but he was a ship’s surgeon . They lived at Enfield, we would go into town and then get a tram out to Enfield. I was a little tacker, about four or five I guess, it was a long walk for me. Mickey came into my life when I was six months old and I buried her when she was 89. When I got married we bought a house down here for the last few years of her life. She nursed Dad and she brought us all up – she was mother to us really. She and Dad had separate lives, they were very fond of one another but they didn’t have any other relationship. She hosted at his dinners and things. He was very much into RSL and on the State board and things like that. Unfortunately my brother Rowen who was two years older than me died 4 years ago when he was 87 and my sister Toni passed away at 95 on January 23rd this year. So I’m the only one left. 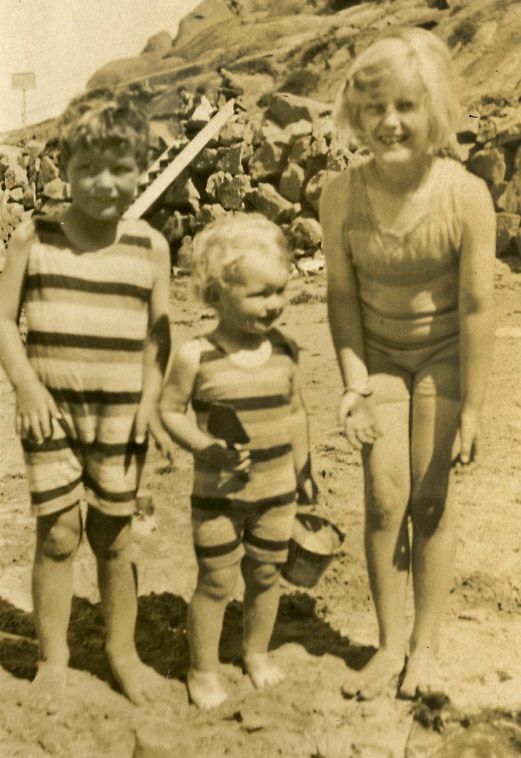 d’Arry at two with brother Rowen and sister Toni. How did you get into the wine business ? 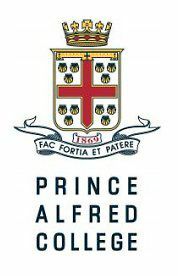 I was just sixteen when I left school after a year at Princes (Prince Alfred College, Adelaide) in 1942. The year I did my Matric at Princes was hard, I was going into town on the bus everyday; leaving at 7.30 in the morning, getting home at 7 and then swotting at night. I also got rubella twice that year – I must have been a tough little bugger. I didn’t do any more study after that, just came home to help Dad. I had to milk the cows, and we had five draught horses to look after, we bought our first tractor just after the war. My older brother did the books for Dad when he was at Uni. When he went to Canberra I took the books on too. So that was probably 1947 or ’48, I did the books, the wages and everything. I was always good at figures, still am I think. Dad never told me much about the winery or winemaking, but Norm King, who came here with Dad when we first bought the property in 1912, showed me how to look after the horses, how to milk the cow and how to put the heading boards on the tanks. 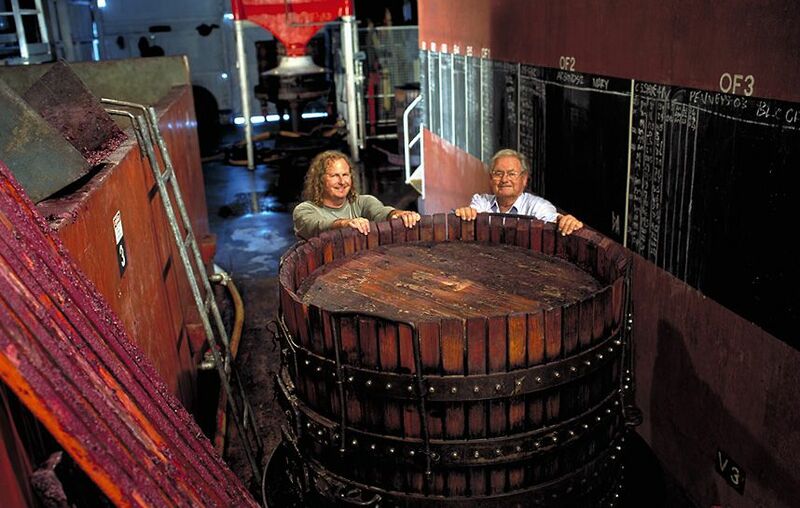 We made wine and we still make reds with fixed head fermentation – submerged cap fermentation. I never really studied winemaking, just grew up with it. 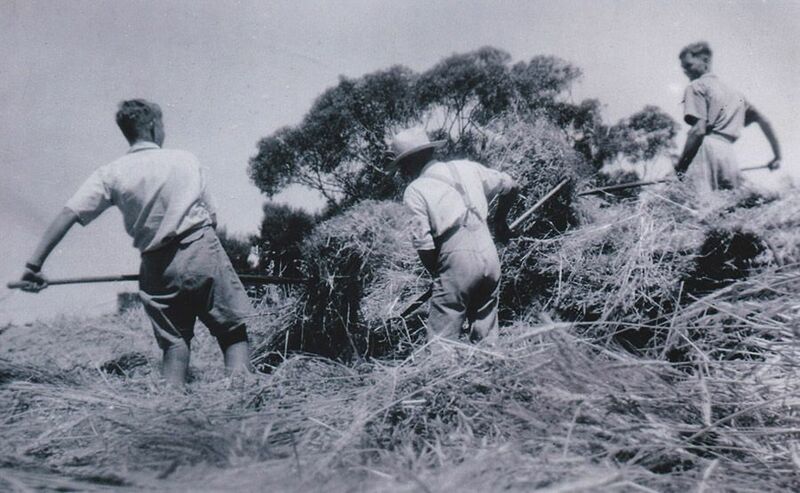 d’Arry, Norm King and Rowen, building a haystack. When did you actually start making wine here ? In 1927 after my mother died, the winery was built for the first vintage in 1928. In those days it was primarily fortified and some table wine. It was all bulk wine for bigger companies, particularly Emu. Cud Kay : Photo courtesy of Kay Bros.
We sent the samples down for them to look at – they would choose what they wanted and tell us if they wanted us to do something to the wines. So I knew how to make fortified wines. The first innovation that came in was the use of sulphur dioxide – we used PMS. We used to mix it up in a galvanised iron bucket…. it dissolved all the galvanised off it which was probably pretty stupid but we didn’t know that . … and then we would bail a bit into the crusher and so on. Then of course in the ’50s Walter Ware came along when he made a ‘sulphitometer’ for liquid So2. We then used to add it at the crusher – as we do today. It was the first modern style, it came onto all the grapes as they were crushed – and pumped through the must pump – you turned the ‘sulphurtomita’ on and it gave them a dose of sulphur. In the early days we used to go up to Cud Kay’s and get a couple of buckets of his fermenting juice. I’d take a couple buckets of my juice up there, tip them in his tank and get two from him and tip them into mine. This was because he was a bit ahead of me and that was how we started our wild ferments. Once we got to sulphur dioxide, the cultivated juice came in and we used to buy yeast to mix up our yeast – we still do that. You can get yeast for different purposes now and you can get a yeast that is tolerant to sulphur dioxide (whereas the wild yeasts weren’t) so we started to control the ferments, that was one of the main technologies. I made wine in the 50s for Penfolds. I never forgot that. Max was a great help – he and Thelma were very good friends of mine. You have had a lot of other friends’ help along the way. Yes, at Emu a famous fellow called John Stanford was down there – he was a great friend and helped me a lot. He went to Sydney later. Another one that helped us a lot was Ben Chaffey – he bought Seaview from Jeff Kay and used to buy Cud’s Rhine riesling fruit. Cud was the first to plant riesling grapes in the area. Ben made that famous – that was the fruit for the Mclaren Vale riesling that Seaview made. That wine used to win lots of gold medals. 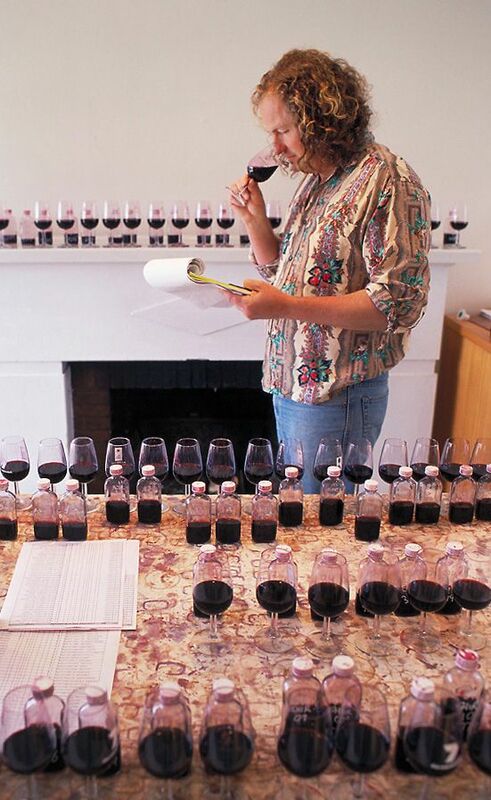 You’d all talk shop – so you really learnt how to make wine from great experts. Even though you were in competition, you all helped each other. Down here in McLaren vale there was no competition, we were all friends together. d’Arenberg wines McLaren Vale. Photo courtesy d’Arenberg. 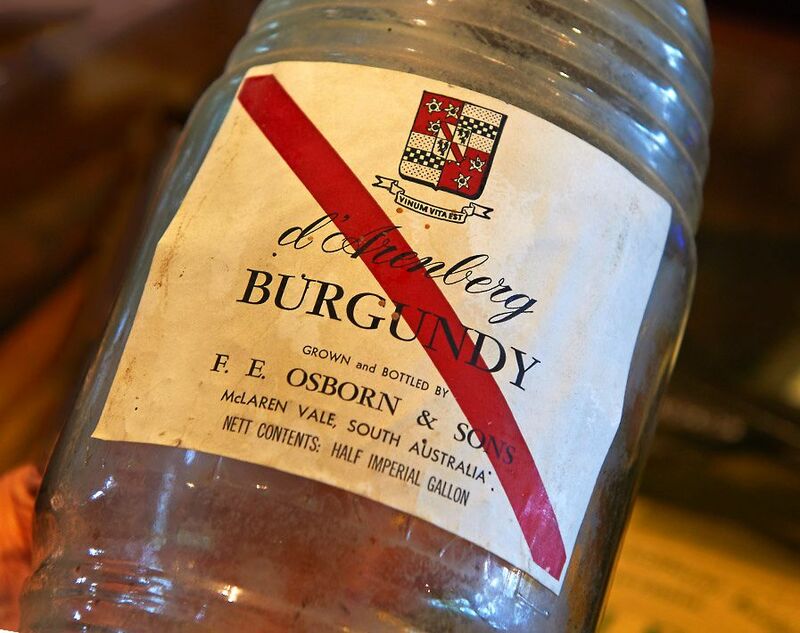 When did you start to produce and sell wines under the d’Arenberg label ? 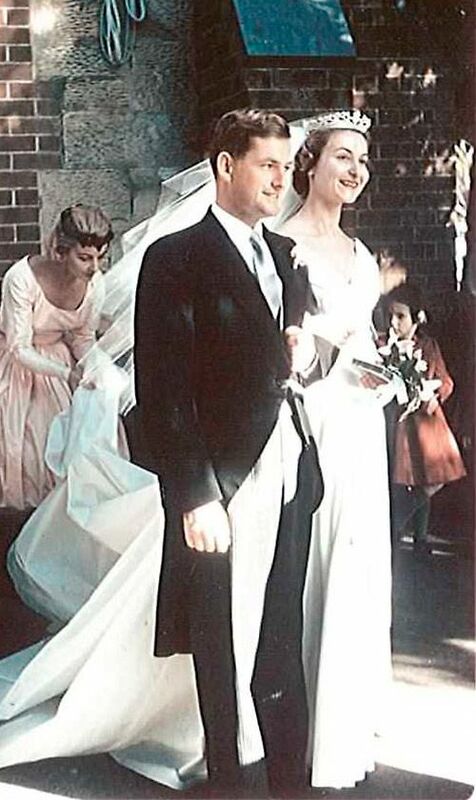 Not until Dad died in 1957.
d’Arry & Pauline’s Wedding Day : 16 Aug 1958. I got married to Pauline in ’58, we had been friends for years. After I married, we decided that we would do our own label and make wine to drink rather than make wine for blending. I had always wanted to do that but dad wasn’t too keen on the idea. 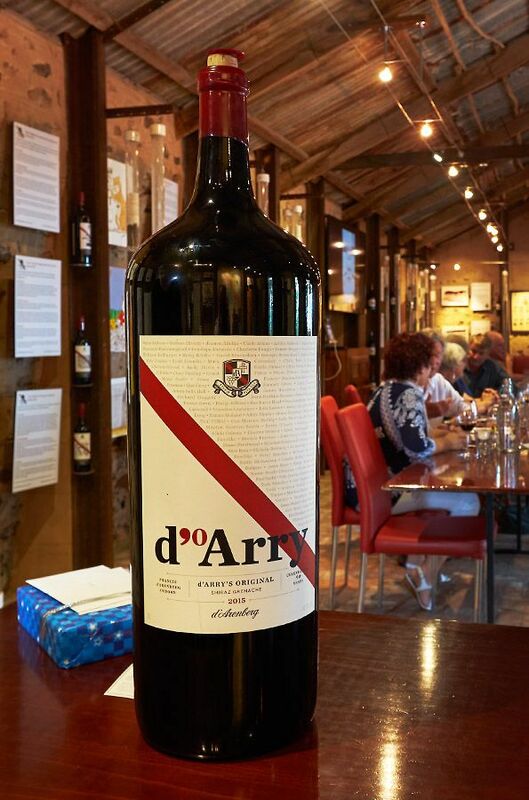 I called it d’Arenberg – my Christian name. 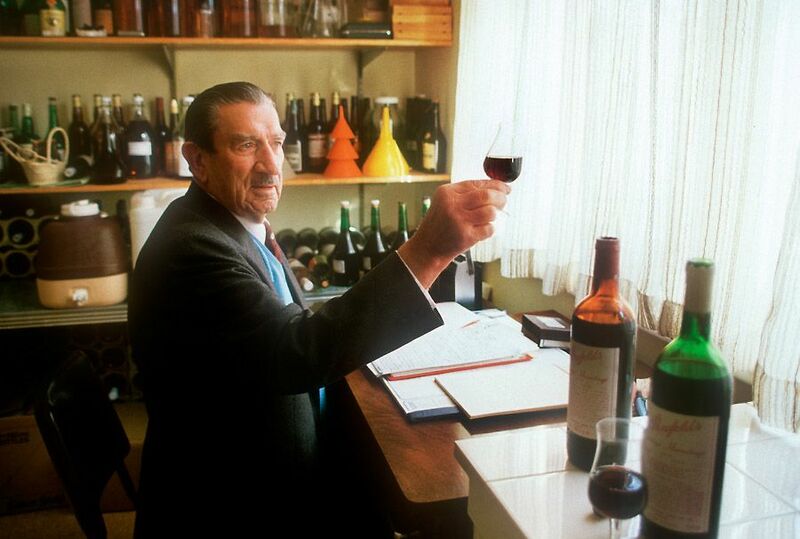 When I started making wine to drink it was a very different business – you could go a lot further with it. We started in ’59 and the big deal, as you realised, in those days was the quantity of flagons we made – red flagons. The flagons became incredibly popular until the 4 litre casks came out. We had about 70% of 2 litre glass ware – it was huge – especially with all the Italian restaurants in Sydney and Melbourne…. how do you fill a bloody carafe out of a cask… a flagon was easy and the quality was pretty good. Then Len Evans came on the scene and he became a great mate of mine. He used to get cross at me for putting too good a wine in flagons. I used to say, “Len – I’ve got to sell it wherever I can.” …but we also had bottles of course. When the quality image really started to improve I needed people for marketing. 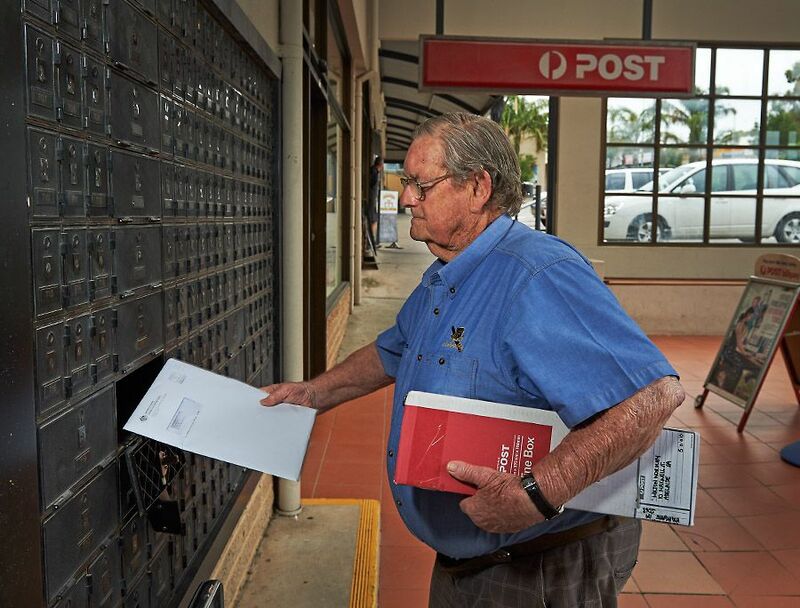 Doug Collett, who was with Berri Co-op, another old mate of mine helped. Doug eventually left Berri Coop and formed a company called BICE, Beverage Industry Consulting Engineers. Original ‘Red Stripe’ flagon. Photo : Milton © Wordley. So we formed d’Arenberg Wines Pty Ltd which was just a bottling company, and we bought bulk wine from the Riverland and blended it with mine and sold it to Lindemans and all these sorts of people. We got a lot bigger then and made more money. 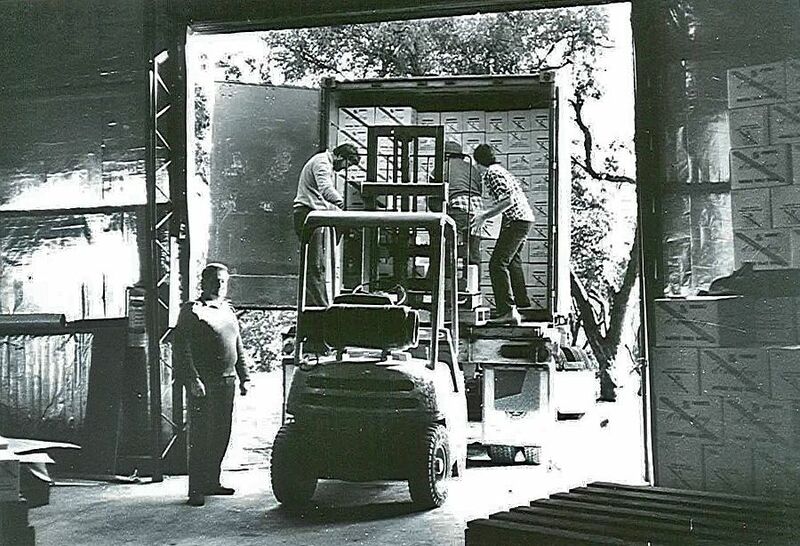 That was mid 60s, we were already going with the 750mm bottles of course, in ’69 we built our own bottling plant. What was the wine you used for the first Flagon or as it was known the as ‘Red Stipe’ in 1959 ? That would have been shiraz and grenache. The shiraz vines were young and the fruit was pretty aggressive, grenache is softer. We blended them to get a balanced easy drinking wine. It just got bigger and bigger, in the finish we didn’t have enough red wine and we used to buy it from bloody South America. Doug was a technician as well and he helped me again. He had skills with fining and used to cut the heavy ones with egg and milk finings and things – so I learnt all of that stuff, back then I used to use gelatine finings which was one way of cutting it back a bit, but he did other ones too – milk was his standard one. Mclaren Vale had always had a lot of grenache. But grenache got a bad name so you never put it on the label. When we started bottling the blend it was softer and we called it ‘Burgundy’. The 67 ‘Burgundy’ won 29 Golds and 8 or 9 trophies – it was Best Red in Australia over a period. We kept 500 dozen and kept on showing it for ages – got over 50 awards with it. You won the 1969 Jimmy Watson with your first cabernet ? Yes, I made my first cabernet in 1968. There wasn’t very much of it, only 1000 gallons or so, and I wanted to use some smaller vats. I bought a second hand vat from Charlie Schahinger. He said, “There is a reworked end on this vat”. One end was buggered – it was bowing and so we got some old oak out of another vat, planked it down smaller and put that new end on. When it came down on the truck it was a hot day and they had to bore out where the bolts had rotted the timber. They put shives in them and one or two had fallen out in the hot weather. Charlie was a big man, too big to go climbing in a small vat, so I climbed in and nailed these staves in there to fill them up. That was the one that had the cabernet in it and the ’68 cabernet got the Jimmy Watson trophy in ’69 ; it would have been in barrel for 12 months. Chairman of judges George Fairbrother said, ” You know why it got it… it was the oak.” It had this big oak end to it, so it gave the right amount of oak. Wolf Blass must have been listening cause he went on and won it three times. What is the story with the red stripe – where did that come from ? We used to sell wine to Emu and they used to give us a case of wine for Christmas. They’d bought the Western Australian winery Houghtons, with the blue stripe. I went to Prince Alfred College you see, so I wanted a red stripe – so thats how it came about. My great friend Don Allnut was Rupert Murdoch’s head of the Adelaide Art Engravers at the News. For years before we got married, I had the car and he had the girls, it was a great arrangement. I used to go to town and pick him up and we would go to the Kalgoorlie hotel in Hindley street or somewhere and have a drink – and we would meet Murdoch occasionally. Anyway Nutty did the label for me, he told me there is a d’Arenberg crest, there’s a copy in the library, why don’t you go down and we get the crest from there. So I did but it had a strange motto under it, I just changed it to ‘Vinum Vita Est’… I did actually get leaving Latin at school. 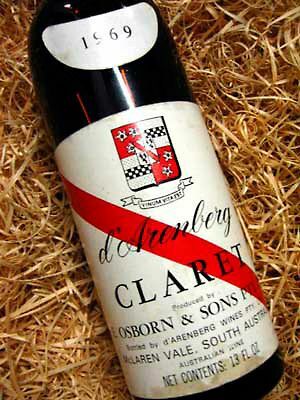 At that time, I didn’t even know a d’Arenberg family existed. 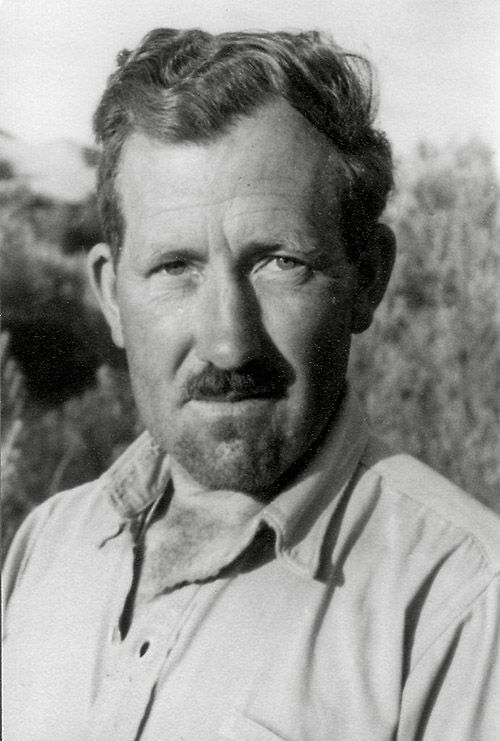 Chester osborn at the tatsing bench. Photo courtesy d’Arenberg. It’s a long story but the short version is that my brother, who was high up in foreign affairs in Canberra at that stage and very good at writing diplomatic letters, established that we had a family link to the d’Arenberg family through a relative in England. I was quite concerned as we had already registered the trademark all over the world. What’s the story behind d’Arry’s original ? 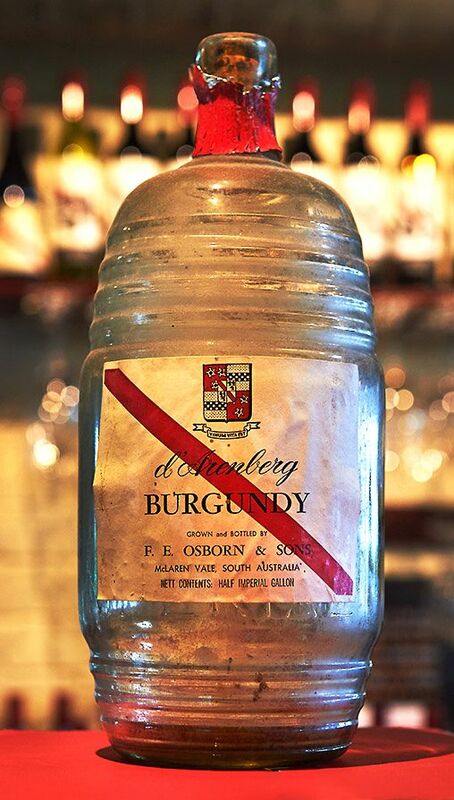 When we started to get much bigger with bottles we just called the blend d’Arenberg burgundy. Chester came home after getting an oenology degree at Roseworthy and we wanted to get bigger and get into export and stuff. Then of course the burgundy and claret names couldn’t be used anymore, so we had to call it something else. So we dropped the burgundy off . What is your role in the company now and how do you and Chester work together ? Chester and I get on alright – I don’t interfere too much with what he’s doing. Occasionally if there is the need to I get involved, like when he started trying to build the cube and everybody was up in arms about what he wanted to do. Ever since he has been here, its been about trying to contain him – he’s impossible to contain – always coming up with new ideas. Chester and d’Arry in the winery. Photo courtesy d’Arenberg. As soon as he came back home from Roseworthy, I left him to do the winemaking. I threw him in the deep end. I’m sort of semi retired now. I only work 6 days a week, but I don’t do much. I get the mail everyday, the accounts go across my desk, they get me to OK all the payments. “What the hell’s this ?”…. Seeing where the money is going is important. We haven’t made very much profit in the last few years because there is so much development going on – but it’s a very viable business. We’ve got about 70 distributors and we sell our wine all over the world, even to Russia – just got a cheque from them this week. We export to all of Europe except Italy, Spain and Portugal. First export container to Holland in 1988. Photo courtesy d’Arenberg. One of the things that Chester does is the management meetings. I don’t get asked to those – so I’ve got right away from that side of things. He is really firing the bullets. I normally get asked to meet and lunch with our agents, its important to keep those relationships strong. You have been involved in many industry bodies over the years…. I was president of Wine and Brandy Producers Association after many years of being treasurer and on the committee and Federal council, where I was also the small winemaker (rep) for many years. I was the only small winemaker, the rest were all the bigger boys. I used to go to meetings and we used to go to ‘Wine Weeks’ all over Australia – they were great fun. After I was president of Wine and Brandy in SA for my three years in the 70s, they put me on the committee to set up the course for oenology. Peter Wall was on it and some of the leading guys who had been in the industry for a long while, were put on this committee. So there I was, having left school at 16, setting up a university degree course for wine. We didn’t do the final thing, the academics did it, but we had to look at it and review it all. The one thing I insisted on including which wasn’t initially on it was computers. I’m computer illiterate and there was nothing about computers in there. So I said, “There has to be a winery computer course – because its all computers today.” I was also on the chamber of commerce for about 25 years representing South Australia with Carl Seppelt in the 60s. I was the ‘Bushing Festival’ chairman for a number of years, but David Hardy started it. The name was his idea, it comes from a European tradition where they hang a myrtle bush outside the winery when the wine is ready for release… so we hung an olive branch. The first Bushing King was in the ‘70s I reckon. We still do a bushing king award but we used to have a major procession in the main street, in the end the insurance premium was $20 grand and we couldn’t afford to do it anymore. 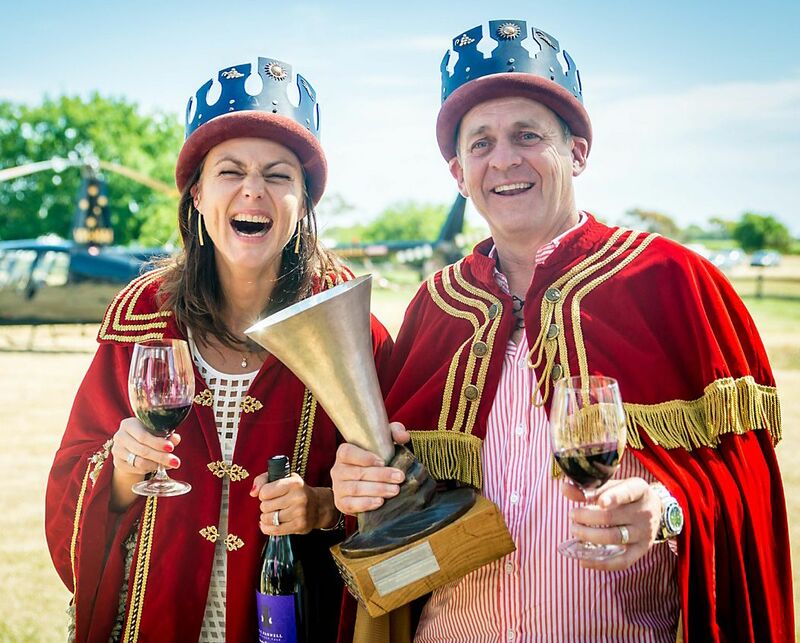 The Cube : InDaily’s “Willy Wonka’s wine factory” article. At first I thought it would be bloody ugly, but now it’s up, I quite like it, wha’da ya think ?. Chester has been wanting to do it for years. The d’Arenberg Cube. Photo courtesy d’Arenberg. A while ago, I got this golden staph thing and had to go to hospital – he came and worried me about the Cube when I was in there. One day I came out of hospital for two hours to attend a board meeting where we had to vote on it. I said, “Yes we’ll do it” and then went back to hospital – got me when I was ill. I had reservations initially because of the cost, 13 million – a lot of money. d’Arry, Chester with Ministers Brock and Bignell, in the early stages of the Cube’s construction. Photo courtesy d’Arenberg. I’m not used to spending 13 million; and its going to be more than that really. 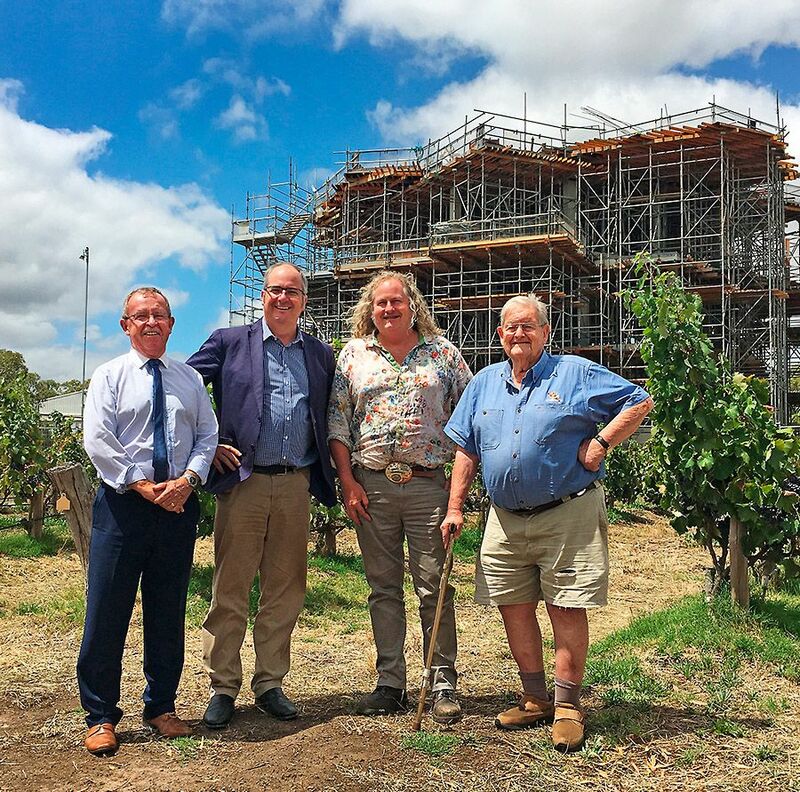 The government of course has contributed .. Biggles (Leon Bignell PM) is our local member – so I said to Biggles, “How come you can give a multinational in the Barossa Valley, 2 million dollars to build a tasting room, and you can’t give me anything to help with the cube”. He said it was because it’s too close to Adelaide. 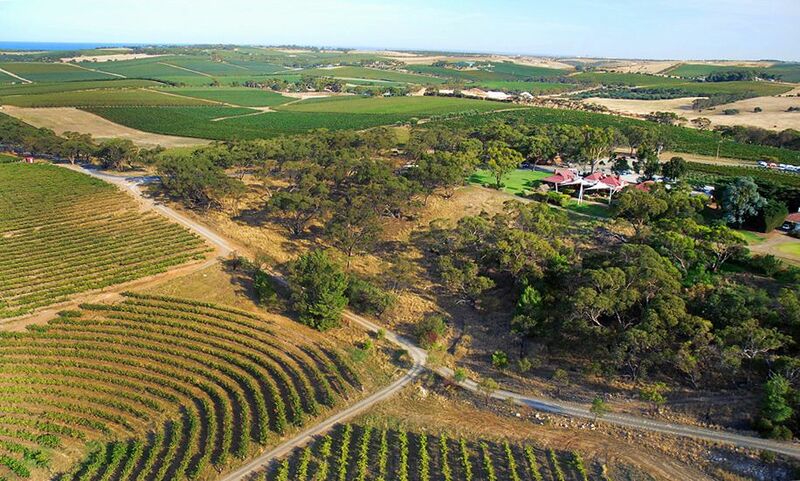 By then the enthusiasm was huge – he and Geoff Brock MP came down and now they think it is a big thing not just for McLaren Vale but for South Australia. We need something that is completely different, we are an iconic winery that’s got wine people all over the world raving. We’ve got d’Arenberg wines on about four of the international airlines here at the moment and our wine is also on the some of the Cunard Cruise Liner’s ships. I gave some talks and lectures about wine on one of the cruises. One day a chap said “How old are you ?” I said about 70 something, which is what I was then – and he said, “Says something about drinking d’Arenberg doesn’t it” and they all clapped. The cube has created such a huge interest in South Australia. The government has promised two million dollars when it’s finished. What style wine do you like ? I reckon I like them all, they all taste pretty good to me. I learnt winemaking really by making wine with all sorts of people and listening to what they said. I never had a very good palate. My palate has never been terribly discerning I think…. I destroyed my nose in the ’60s using too much nasal spray. I am famous for my pissy Pinot statements. So famous that my agent David Johnston down in Tassie, still gives me Freycinet’s Pinot for Christmas every year and they are lovely. Anything else you’dlike to say ? There are some lovely people in this industry. Especially here in McLaren Vale, really really nice people, I am very lucky to be a part of it. 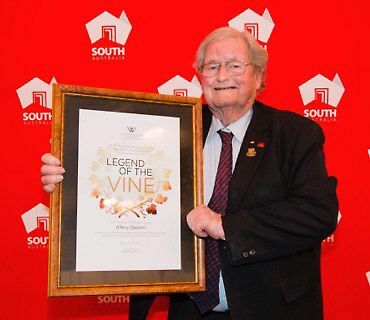 I got this Legend of the industry award at the ‘Royal Adelaide’ wine show – and Halliday is one of those – imagine being a legend like Halliday. d’Arry with his WCA ‘Legend of Wine’ award. Photo courtesy d’Arenberg. I felt that was a huge compliment.